Fiber optics are essentially light pipes. The group of sensors known as fiber optic thermometers generally refer to those devices measuring higher temperatures wherein blackbody radiation physics are utilized. Lower temperature targets--say from -100°C to 400°C--can be measured by activating various sensing materials such as phosphors, semiconductors or liquid crystals with fiber optic links offering the environmental and remoteness advantages. - Certain cables can handle ambient temperatures to over 300°C--higher with air or water purging. Non-contact infrared thermal monitoring systems that represent a unique technological approach for monitoring and controlling process temperatures. These units combine fiber optics or line-of-sight optics with advanced electronic technology into a system that continuously monitors infrared radiation (a function of temperature) in real time and without physically contacting the target material. The result is a highly reliable system offering outstanding accuracy and repeatability with high response speed. The OS4000 series high speed industrial fiber optic infrared transmitters measure temperature ranges from 200 to 1600ºC (392 to 2912°F) using three standard optical fields of view and three standard fiber optic cable lengths. This unit offers many standard features such as adjustable Emissivity, linear analog output, high and low alarm voltage output, RS232 PC interface, built-in laser sighting, etc. Through Windows based PC interface software, the user can select response time, Peak-Hold function, high and low alarm set points, and data logging. This unit is packaged in a space saving of 2.5" OD by 6" long. The mounting bracket and two mounting nuts are included. The OMEGA iR2™ Series is the state-of-the-art instrument for difficult and demanding high temperature (300ºC-3000ºC) applications. It is ideally suited for measurement and control applications involving metals, glass, semiconductors and more. The iR2 is extremely fast and accurate with a response time of 10 msec and accuracy of 0.2% of full scale. The HHTFO-101 offers impressive versatility. Battery operated for maximum user freedom, this single-channel instrument allows you to freely move from one area to another to measure temperatures at various critical sensing points. The HHTFO-101 is a valuable monitoring tool for a wide range of applications in energy, industrial and research activities, such as hot spot monitoring inside power transformers during manufacturing and heat runs. It can also be used in various high voltage applications and MW/RF heating applications. 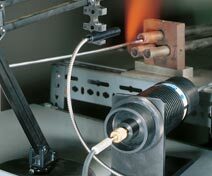 Fiber optic thermometers have proven invaluable in measuring temperatures in basic metals and glass productions as well as in the initial hot forming processes for such materials. Boiler burner flames and tube temperatures as well as critical turbine areas are typical applications in power generation operations. Rolling lines in steel and other fabricated metal plants also pose harsh conditions which are well handled by fiber optics. Typical applications include furnaces of all sorts, sintering operations, ovens and kilns. Automated welding, brazing and annealing equipment often generate large electrical fields which can disturb conventional sensors. High temperature processing operations in cement, refractory and chemical industries often use fiber optic temperature sensing. At somewhat lesser temperatures, plastics processing, paper making and food processing operations are making more use of the technology. Fiber optics are also used in fusion, sputtering, and crystal growth processes in the semiconductor industry. Beyond direct radiant energy collection or two-color methods, fiber optic glasses can be doped to serve directly as radiation emitters at hot spots so that the fiber optics serve as both the sensor and the media. Westinghouse has developed such an approach for distributed temperature monitoring in nuclear reactors. A similar approach can be used for fire detection around turbines or jet engines. Internal "hot spot" reflecting circuitry has been incorporated to determine the location of the hot area. An activated temperature measuring system involves a sensing head containing a luminescing phosphor attached at the tip of an optical fiber. A pulsed light source from the instrument package excites the phosphor to luminescence and the decay rate of the luminescence is dependent on the temperature. These methods work well for non-glowing, but hot surfaces below about 400°C.